BURIED IN PAPER? WE CAN CURE THAT! Harter’s C-Cure-It Data Destruction is a secure confidential record destruction company serving the La Crosse, Wisconsin area. Why shred your materials? Shredding materials protects sensitive and private company information, it avoids identity theft for customers and employees, and shredded material is recycled. You can be guaranteed all your shredded material will be recycled by Harter’s C-Cure-It sister company Green Circle Recycling, LLC. Harter’s C-Cure-It sister companies including Harter’s Quick Clean Up Service, Inc and Harter’s Trash & Recycling, Inc have been earning business and trust for more than 50 years in the Coulee Region. Harter’s operates a few different businesses. Harter’s Trash and Recycling provides dumpster, tote, and roll off service to businesses and residents. Harter’s Quick Clean-Up services surrounding cities to pick up trash and recycling from residential homes. Green Circle Recycling sorts, processes, and sells the recyclable material to be re-purposed. Harter’s has a plant based shredder for paper document shredding. 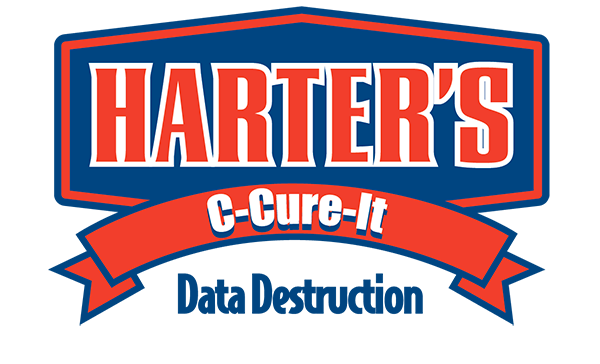 Harter’s C-Cure-It is a member of the National Association for Information Destruction (NAID) and is AAA certified through NAID. Harter’s C-Cure-It adheres to the high standards and operational practices required to ensure that confidential documents are destroyed in a safe, secure, and professional manner. At Harter’s our number one goal is to keep our clients happy. We’ve been able to serve the area for so many years because we’ve stayed true to very basic principle of providing excellent customer service. Great for day to day protection of all your confidential documents. Great for large volumes or periodic clean outs. For smaller quantities or one-time clean outs.